The HOM-BOT Turbo+ robot vacuum combines camera controls and security features. 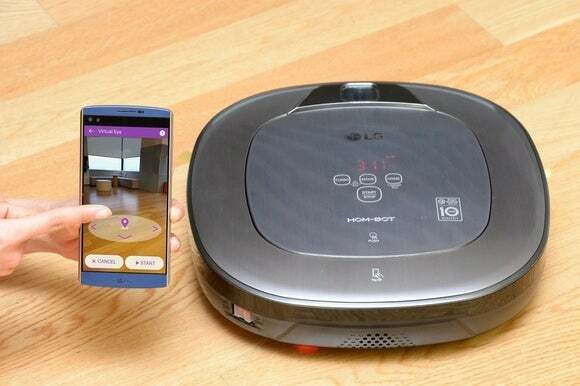 Robot vacuums with sophisticated mapping systems are everywhere these days, but the latest from LG is taking a more novel approach. Instead of relying solely on lasers or built-in cameras to figure out where to clean, the mechanically-named HOM-BOT Turbo+ links up with a companion smartphone app for instructions. Users can then point their phone camera at areas that need extra cleaning, and the HOM-BOT will head to that location. The vacuum does have its own camera sensors on board for determining where it has cleaned already. The front camera also doubles as a security feature, so users can view a live feed from the vacuum on their phone, or receive photos when the vacuum detects movement. A vacuum with similar security features recently achieved funding on Kickstarter. LG hasn’t said what kind of battery life to expect from its robot vacuum, which platforms the companion app will support, how much the HOM-BOT will cost, or when it’ll be available (though the last-gen model sells for about $500 currently). The company plans to show off its new robot at CES next month, and could provide more details then. Why this matters: Like other robot vacuum makers, LG is trying to solve the problem of dead zones by including more advanced sensors. But so far, the HOM-BOT is the only one that turns users’ smartphone cameras into a set of eyes. It could be an impressive addition if the robot can properly understand when users are pointing at hard-to-reach areas.